I want to talk to you about dry eyes and dirty eyes. Also, I shall explain how you can remedy having them. 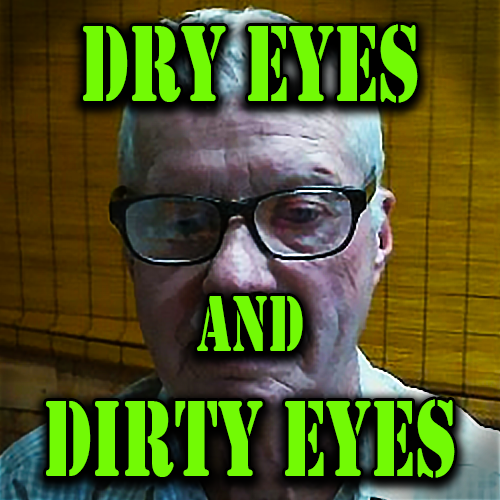 Dry and dirty eyes have many causes and we can often fix them by a daily cleaning. Many years ago, in the land of my youth, I worked in a steel mill. At the open hearths and coke ovens the dust was so thick you couldn’t see your hands. On the coke ovens the smoke was like an all-enveloping fog. At the electric furnaces I shoveled the graphite that was knee deep. All this work was done without protective equipment. The old Mill-Hands taught me how to wash the dirt from my eyes with handfuls of water—the eyes paid a price. Now, many years later, I find that daily cleansing is still important. My problem with irritated eyes lasted for several years. I had placed the blame on long hours of writing, reading and computer work. Using eye drops every day and even at night, my eyes still felt gritty. I was ready to start doctoring for allergies. Now I began to think. Maybe a better solution might be to try washing my eyes. Recently a doctor told another friend, a retired priest, that he has eye dandruff and needs to do eye exercises as well as wash his eyes. A few simple exercises will help the eyes clean themselves. The main concern is to not put pressure on the eyeball. It is like a balloon that is filled with water and is easily damaged. Not enough water in the diet can also cause this problem. If you regularly drink diuretics such as coffee or other caffeinated beverages or live in a dry or windy climate your eyes may dry or get dirty. Sufficient water is vital for our body systems to function and necessary for our eyes to produce tears. Cleaning the eyes with boric acid Eye wash. If you regularly drink diuretics such as coffee or other caffeinated beverages or live in a dry or windy climate you may need more water in your diet. Sufficient water is vital for our body systems to function and necessary for our eyes to produce tears. Tears keep the mucous membrane covering the eye, the conjunctiva, moist and contain a neutralizing enzyme that combats infection. For optimal relief from dry eyes, drink the recommended amount of water every day.